Park Ski Resort USA - the most skiing & so much more! Park City ski resort USA - the most skiing & so much more! In 2015, Park City became the largest ski resort in the USA, after the old Park City was linked to Canyons with the Quicksilver gondola. Re-named the one "Park City" this huge ski area now has over 300 runs with 7300 acres of skiing. Skiers / boarders can ski from one village to another and they are all linked by the free bus and are only 5 - 15 mins apart. 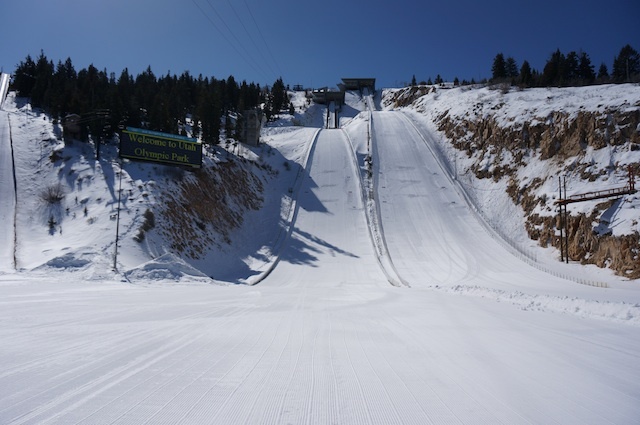 There is no doubt the skiing is fantastic in Park City and we've had feedback from clients who love the variety of runs. Deer Valley ski resort is separate, but right next to Park City ski resort & Deer Valley is only 5 mins drive / bus from the town of Park City. The historic Park City town centre around Main Street is full of wonderful restaurants, independent shops, coffee shops, bars & music venues. It's a fantastic town to peruse & explore. 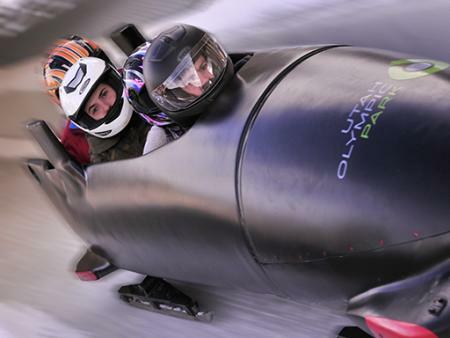 Park City is home to Utah's Olympic Park, just 10 mins drive / bus from Canyons base village, Park City. Take a guided tour of the Olympic Park & hear amazing stories about Olympic achievements & some peculiar tales. 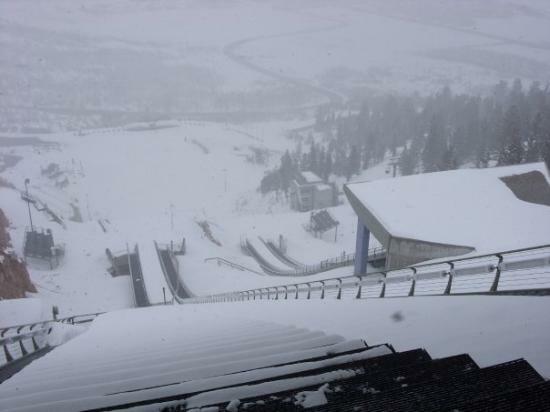 Stand right at the top of the ski jump & imagine how it would feel to launch yourself off the 120 metre jump on skis. 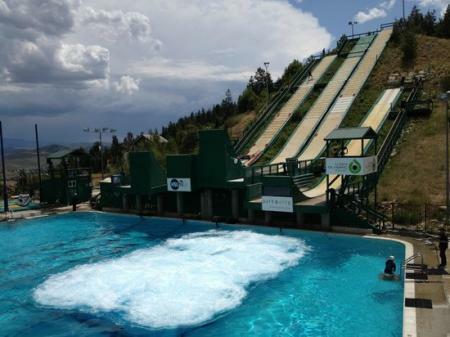 Watch skiers train for the freestyle aerials competition flying off the jumps into the training pool. Visit the small museum & try your hand at virtual ski jumping, games & check out the old school ski outfits! If you are in resort over New Year watch the ski jumping & nordic combined US Olympic Team Trails (Dec 30-31, 2017). "Tanger Outlets" is Park City's outlet mall, again just about 10 mins from canyons base village on the bus. Open daily (except Christmas Day), you can shop to your heart's content at big brand stores as well as some specialty shops. Head to shopper services, to join the Tanger Club to get a free coupon book, seasonal member specials & birthday rewards. Club members also receive receive FREE gift cards & fashion gifts with Tanger store receipts, at certain levels of purchase. The prices are already good & these help you save even more on your holiday shopping spree! Kimball Junction (locally known as "New Town") offers the ultimate in one-stop convenience for shopping, restaurants, recreation & entertainment. It has blossomed over the last 10 years and has become a locals hotstpot. The "Redstone" shopping centre, located at Kimball Junction has upscale boutiques, stores & restaurants including Whole Foods, designer clothing & sportswear, home furnishings & restaurants. Take in a movie at "Redstone 8" cinemas & watch the latest film in one of the state-of-the-art movie theatres with full digital projection presentation - the popcorn's not bad too! Relax or work out at the gym, pilates studio, nail salons or tanning booths. It may be Winter but it's never too chilly for a Cold Stone Creamery ice cream or go to "Booster Juice" for a healthy smoothie! Restaurants include Classic Italina at Ghidotti's, sushi, pizza, chinese & a brew pub & tend to be a little less pricey than some of the in town eateries. "Jupiter Bowl" is nearby & home to a luxury bowling alley with 12 main lanes & 4 private lanes, restaurant, bar & 70 foot video wall, plus billiards & an arcade. We hope you have a fantastic, fun filled time in the Park City area, whether you're skiing at Park City ski resort or Deer Valley Resort or both!